Get Snug and Warm with Winter Branded Promotional Items! HelloAfrica Promotions > Blog > Get Snug and Warm with Winter Branded Promotional Items! Winter is around the corner! What better way to leave a lasting impression on your employees, clients and potential clients than with Winter promotional items that will keep them extra warm and snug throughout the colder months. Below is a list of promotional branded items your stakeholders are guaranteed to use a little more during the Winter months, but will love all throughout the year. Thermal mugs remain popular because of their convenience and contribution to the environment. These mess-free travels mugs keep your coffee or tea hot and can be used repeatedly. A bonus is that they are the perfect accessories for coffee-lovers all-year round. Body warmers remain a winter wardrobe staple because of their style, practicality and how effortlessly cool they are. They are a popular choice for companies because their employees are most likely to wear them because of how good they look. They can be found in different colours and styles and are the perfect way to ensure your company stands out. Apart from being cosy, blankets are often sentimental and nostalgic pieces. Gifting your employees or customers with a soft branded blanket will sure pull on the heart strings- leaving a lasting and emotional impression on them. 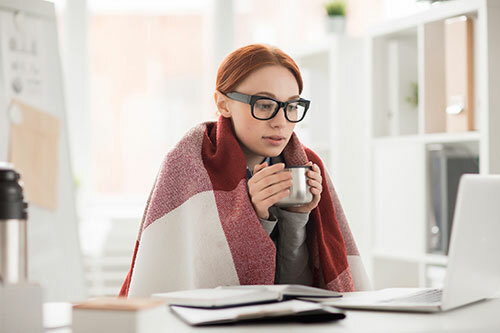 Winter is infamous for its common colds and flu. As a result, many people can’t leave the house without some pocket tissues. Giving away company-branded pocket tissues is the ultimate way to make sure stakeholders never forget about your brand. Whether they are constantly whipping them out to blow their nose, or handing them to someone who needs them, they are sure to increase your brand exposure. You can never go wrong with a loaded hamper! Coffee and tea hampers make for the best corporate gifts because there’s a little something for everyone in them. Furthermore, you don’t have to worry about this gift not being used because people often can’t stop digging in them looking for goodies. If you’re looking for some great giveaways this Winter, then Hello-Africa is the perfect place to shop quality branded promotional items you and your clients will love. We have a wide range of clothing items and gifts you can customize to your liking at an affordable price. Jump onto the corporate gift bandwagon and watch your brand grow leaps and bounds!